Mixed by Dume41 and Gabriel Teodros at The Legion of Dume, Seattle, except Beit and Still With You mixed by Amos Miller at Buttermilk Studios, Seattle, and Sangre Nueva mixed by Hache at Espadasofia Studios, Mexico City. Mastered by Dume41 at Seattle’s Hip Hop mastering studio The Legion of Dume, Seattle, except Sangre Nueva mastered by Hache at Espadasofia Studios, Mexico City. ILLustrations and cover by Julay (Montreal, Quebec, Canada). Cultural worker and hip hop pathfinder Gabriel Teodros stands poised to turn the clock backwards to reach the future. His sophomore solo effort, ‘Colored People’s Time Machine,’ is an examination of the history, dreams and future of native people everywhere. Not content to analyze the past, Teodros prepares listeners for a future free of the constraints of genre. Teodros’ range runs the gamut of human emotional expression, examining such personal experiences as depression, family loss, and lost and found love. Teodros, never content to be pushed into a box, enlists producers with sounds as divergent as those of Bean One (X-Clan, Black Sheep), Justo (The Physics) and Budo (Grieves), and collaborated with special guests, Meklit Hadero and Mexico’s Bocafloja. Teodros streams this synergy into his own veritable flux capacitor, shifting from true school head crushing kicks and snares (Blossoms of Fire), to future molded Kurzweilistic invisible piano stylings (Alien Native). 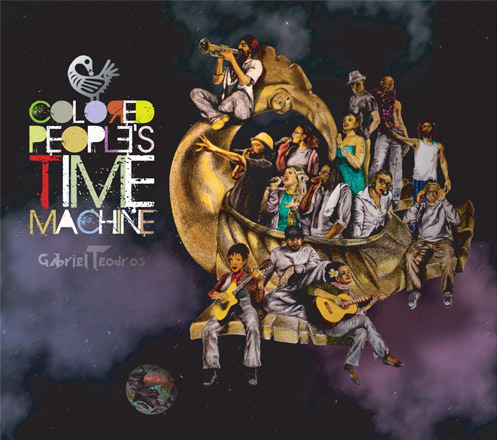 Colored People’s Time Machine steps back in time on January 19th, 2012.